Chef Andrew Fairlie is stepping down from his his restaurant at Gleneagles, the only in Scotland to hold two Michelin stars. Fairlie was diagnosed with cancer in 2005, and since then has undergone chemotherapy, radiotherapy, and surgery, but doctors have confirmed the brain tumour is now terminal. 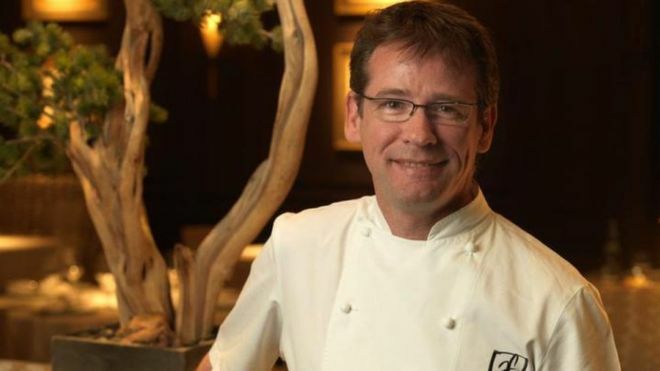 As a result, the chef announced he will be stepping down from Restaurant Andrew Fairlie on Friday February 1, 2019. Fairlie, 54, has been struggling with fatigue and mobility issues and running a busy kitchen is now untenable. Head chef Stevie McLaughlin will take charge after Fairlie departs. The sad news was first reported in The Times. Fairlie told the paper: “Giving up my restaurant kitchen was the hardest part,” after bidding farewell to colleagues on Saturday. “The fact that I’ll never be back, never have that buzz and atmosphere of the kitchen again, was very emotional. But it’s dangerous for me to be there. I’d just be a liability. Fairlie began his training aged 15 in his hometown of Perth and first worked under chef Keith Podmore. After the budding star was rejected by 22 restaurants, Podmore advised he apply for the Roux scholarship, which he won. It led to him being given a job with Michel Guerard at Les Prés d’Eugénie in Gascony. Fairlie was then sent to work in Paris, at Hotel Crillion, where he was promoted after just 18 months. Numerous other roles followed, and after a chance meeting at Gleneagles’ then food and beverage director Alan Hill, in which Fairlie said it was a shame the hotel didn’t have a niche, high-end restaurant, he was brought in. Gleneagles won a star almost immediately. It won a second two years later. Readers have said in the past the restaurant built by Fairlie provides a “once in a lifetime experience“. Many – from politicians, to chefs, to journalists – have spoken of their admiration for Fairlie and talked of their sorrow at the news. So sad to hear this @AndrewFairlie1 My meal with you was one of the best I've ever had. You'll always be one of the most iconic chefs in the country and a lovely person to boot! The perfect role model for our industry! Enjoy your well earnt time with your family Chef. If success could be measured by the Love and kindness you are surrounded by today I feel like the richest man in the world thank you all from the bottom of my heart. News Andrew Fairlie, Gleneagles, Scotland. permalink.